It's no secret: Apple wants your money. To help advance the goal, of course, the company makes buying music, movies, and apps from the iTunes store as easy as possible. 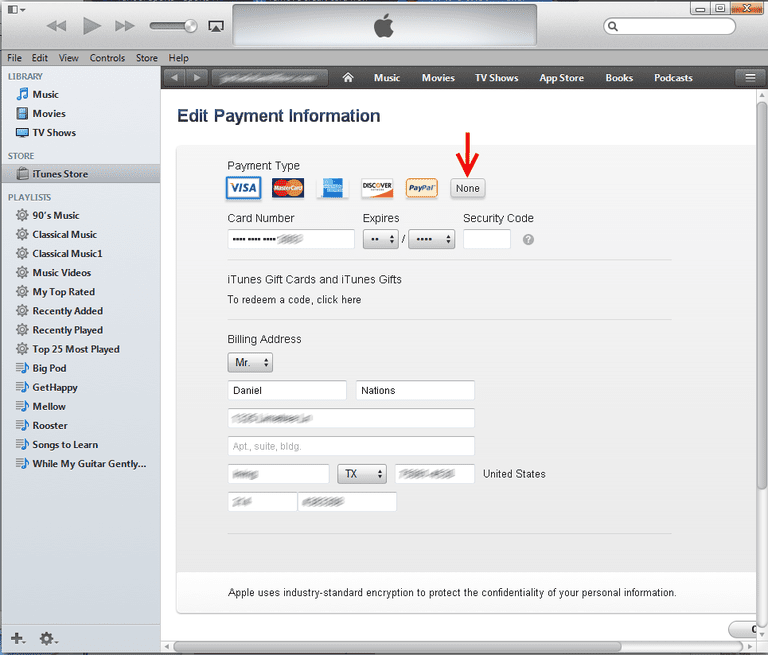 To that end, Apple requires you to supply the credentials for a valid form of payment, usually a credit card, when you register for an iTunes account. The info is kept on file, so it's always at hand for quick purchases. If you're not comfortable with your credit card info being stored in this way, however—maybe you're worried about privacy, or you don't want your child making unauthorized purchases while using your computer—you can remove the card from the iTunes store altogether. Once signed in, choose View my Apple ID from the Store menu. You may have to enter your password again. In the Apple ID Summary, click on the Edit link directly to the right of Payment Type. This allows you to edit your choice of payment. Instead of choosing a credit card, click the None button. Scroll down and choose Done from the bottom. That's it. Your Apple iTunes Account now has no credit card attached. Now that you have the credit card removed from your iTunes account, how do you get apps, music, movies, and books on your iPad? There are a number of options, including one that allows your kids to download what they want without having to do anything special. Give apps as gifts. Instead of buying apps on the iPad, you can use a different account that has a credit card attached to buy the apps. You can even give music and movies as gifts via the iTunes store. Set up an iTunes allowance. This option is great if you want a low-maintenance solution. Giving apps, music, and movies allow you to monitor what your kid is doing on the iPad more closely. Setting up an allowance can be great for older kids, as well. Add and remove. This one takes the most maintenance, but it is a viable solution. You simply add the credit card to the account when you want to purchase something, and then remove it again. It is best if you schedule once-a-week or once-a-month purchases for the iPad. Load it up first. It is the easiest way if you have younger children who don't need the latest and greatest apps on their iPads. After you've registered for an account, download all of the apps, books, music, and movies you want on it before removing the credit card. For more info on keeping your info safe when you share a computer with your kids, see How to Childproof Your iPad. Is the Apple ID Different From an iTunes ID?